Earlier this year we introduced in-app messaging to the Mixlr desktop app. 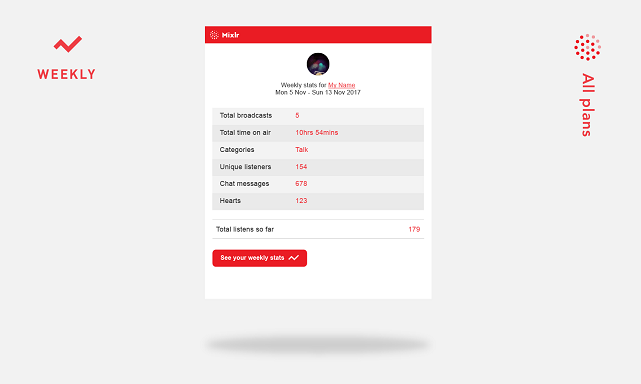 This enables broadcasters to contact us directly through the app itself with questions about setting up their equipment, managing their subscription, or anything else! It also means that we can send messages to broadcasters to let you know about new features and other useful updates. Clicking the ‘Help’ button in the app will open the Help window. If there is a number displayed next to the ‘Help’ button (as in the picture above) it means that we have sent you a message. From this window you can contact us with any new queries by clicking the ‘New Conversation’ button. You’ll also be able to see any messages that we’ve sent to you. To open these messages just click on the preview text that you can see here. 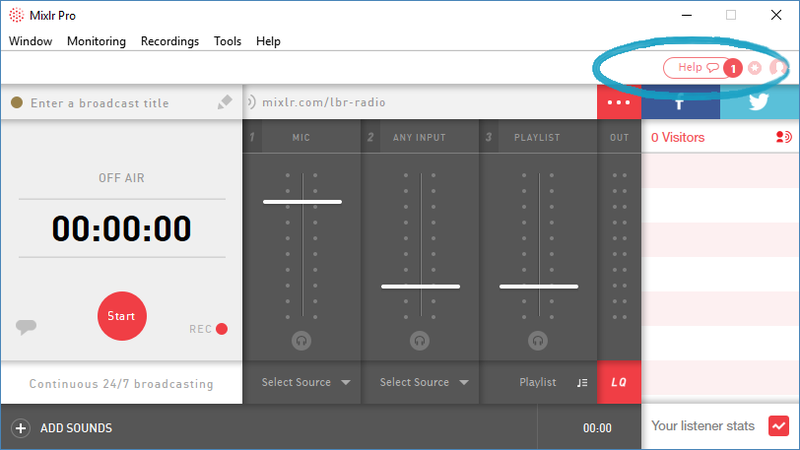 Broadcasters using older versions of the Mixlr desktop app won’t be able to access in-app support. You can update your software to the latest version here. 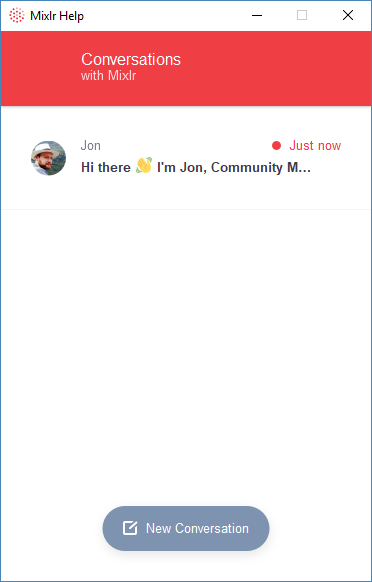 We’d love to get your feedback about the in-app messaging feature – why not contact us through your Mixlr desktop app to let us know what you think? This isn’t the only way to contact us of course – you’ll still be able to get in touch with any questions via our support centre. 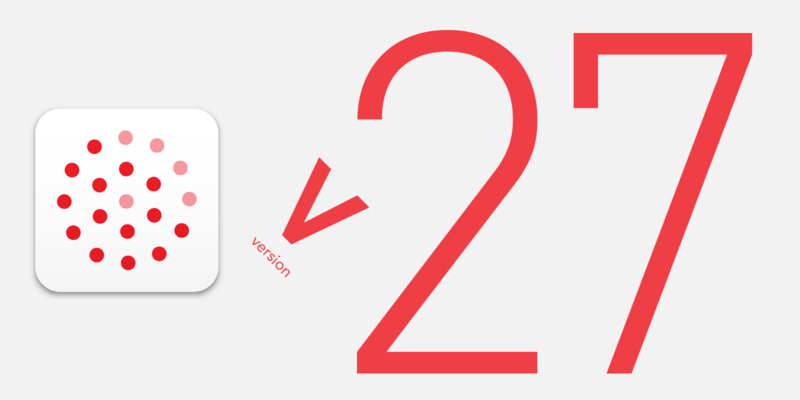 The latest update of Safari (v11) has changed how audio is handled in the browser. Auto-Playing audio has been disabled by default meaning an action from the listener (for example, clicking a play button) is now required in order to play audio. 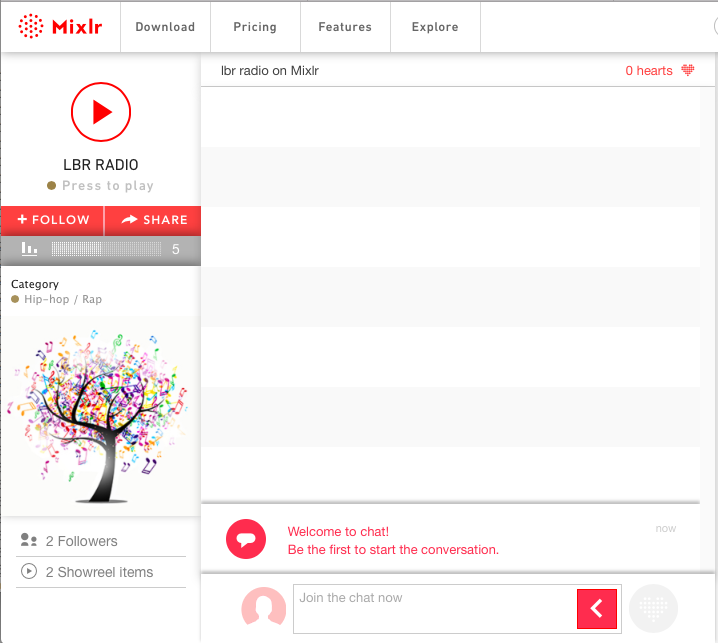 This means that your Mixlr livepage will no longer automatically play for your listeners if they use Safari. A similar update is expected to affect Chrome in the near future (starting with v64). To ensure your listeners can still tune in to your broadcasts we’ve updated the livepage so when someone visits your page using Safari they will now see a play button. Clicking this button will start your live broadcast playing. It’s also possible for your listeners to enable Auto-Play in Safari – see this support article for more information. If you have any questions please get in touch with the team. As you might already be aware, every broadcast you make with Mixlr is recorded to your hard drive as an MP3. With the latest version of the desktop app, it is easier to access your recordings so that you can edit them, and apply those final touches before you upload them to your favourite services. Maybe you want to trim them, make short clips to share on social media, or simply archive them. In this blog post, you’ll find tips on how to get the most of the recording of your live broadcast with Mixlr. We’ll cover editing, sharing and creating a podcast with your recordings. Once you have found your recording, before you share it, it’s a good idea to make sure it sounds as good as possible. This may involve changing the overall volume, adding music to the intro or editing some mistakes out. Luckily there’s plenty of audio editing software out there that make editing easy. We recommend Audacity – it’s free and super simple to use. We recommend you normalize your recording, this will ensure the volume of your recording is consistent throughout. You could also increase the gain of your recording to make it as loud as possible. Now that you’ve cleaned up and edited the recording of your broadcast, perhaps you want to upload your live podcast episode to iTunes, put your last live gig on Soundcloud or last DJ set on Mixcloud. Or even share your awesome talk show on another platform, or upload it somewhere for people to listen to it again. 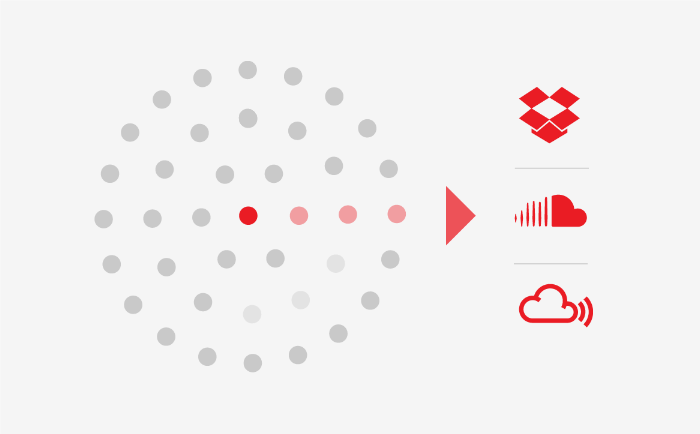 Mixlr gives you the opportunity to connect your account with SoundCloud, Mixcloud, Dropbox and more, so that you can easily export your shows directly from your showreel. When you upload your recordings to SoundCloud or Mixcloud, you get access to their embeddable players. This will allow you to add a player containing your recording to your website or app so that fans can listen back there. One of the great things about SoundCloud is that every account (including their free option) comes with an RSS feed. An RSS feed allows podcast directories like iTunes or Libsyn to get the latest episodes of your podcast and make them available via their apps. So, once you upload your recording to SoundCloud it will automatically be available as podcast on iTunes. 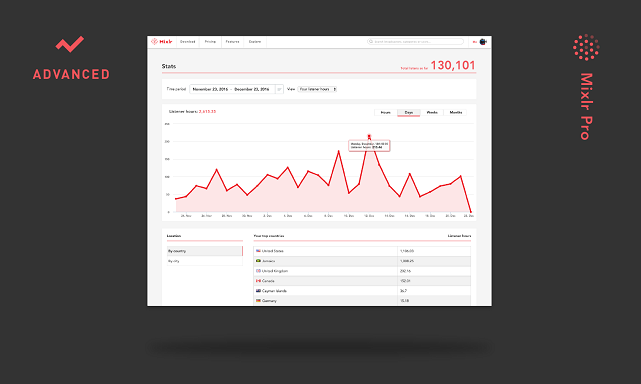 An RRS feed gives you the power to create a podcast series that’s accessible globally. Very cool! It’s always a good idea to edit the recording of your live broadcast before you upload though…Just don’t forget to turn recording on before you start broadcasting! 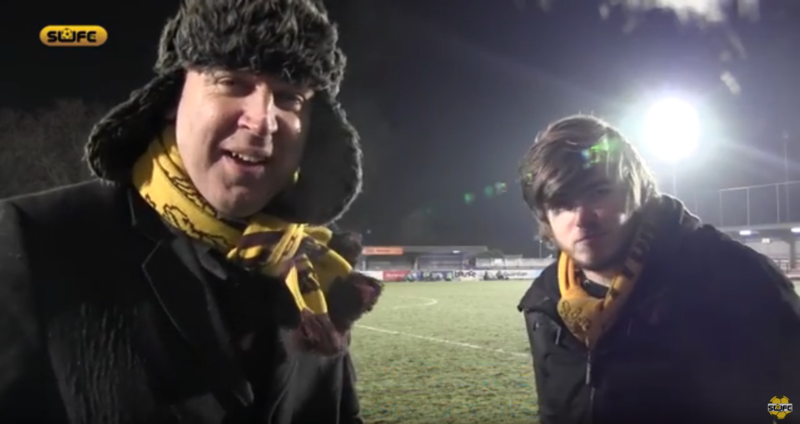 Listen live as non-league Sutton United host Arsenal in the FA Cup, with commentary from comedian Tim Vine. SUFCtv are regular broadcasters on Mixlr, which they use to provide commentary on the weekly fixtures of Sutton United FC, a non-professional football team based in south west London. Their next broadcast promises to be something special. Having progressed to the fifth round of the FA Cup, the oldest cup competition in the sport, Sutton United – with an average attendance of 1,500 – will host the famous Arsenal FC, a team which makes hundreds of millions of pounds a year and usually sees crowds of over 60,000 at their home games. After defeating several professional teams in the FA Cup already – including Wimbledon AFC and Leeds United FC, a team who have been crowned champions of England three times – Sutton are relishing the prospect of tonight’s game with Arsenal. For tonight’s broadcast, regular presenter Tom Mitchell will again by joined British comedian Tim Vine, better known for his appearances on the BBC and ITV. They’ve already provided some amazing entertainment (check out this showreel recording of the last few minutes of the Wimbledon game!) and we’ve no doubt there’s more of the same in store tonight. To join them for the broadcast, tune in on Mixlr via SUFCtv’s livepage, or with our iOS or Android apps – just search for ‘SUFCtv’. Kick off is at 7.55pm UK time. 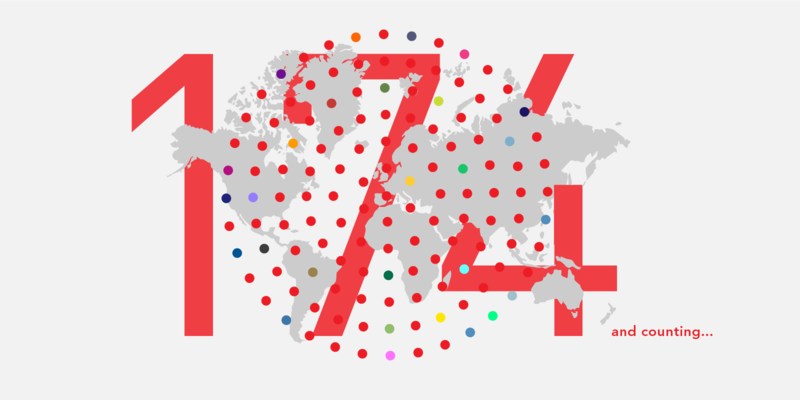 Did you know there are only 195 countries in the world, and Mixlr is already being used in 174 of them? We’ve almost got the full A to Z – in January we had people broadcasting from places ranging from Aruba to Zambia. Last month the USA was the busiest, with 16% of broadcasters going live stateside, while in third place, just south of the border, was Mexico with 5%. Picking up silver was Egypt on 7%. Further afield we regularly see broadcasts from Belize to Belarus, Libya to Latvia, and Switzerland to Swaziland. We’re seeing more and more broadcasters in places of all shapes and sizes, from giants as big as Russia to islands as small as Malta. We’re still missing a few places, so if you know anyone from Liechtenstein, San Marino or Monaco we’d love to hear from them and help them get broadcasting. Everyone is welcome! Sign up and get started with Mixlr today. 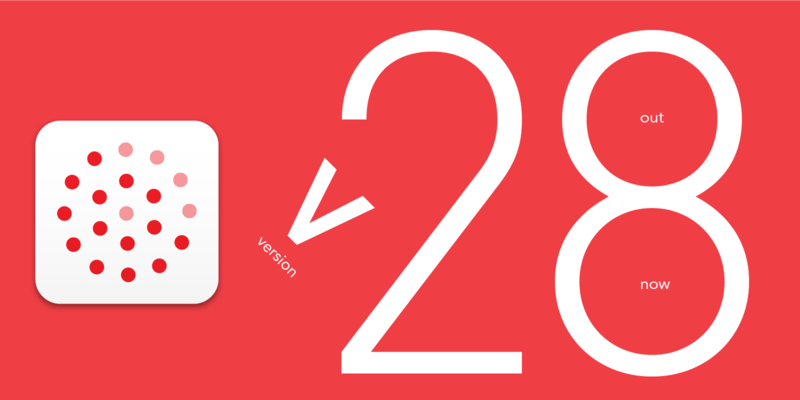 We released v27 for Windows and Mac earlier this week. Perhaps the most important change has been to make it much easier to access your live broadcast recordings. As you might already be aware, every broadcast you make is recorded to your hard drive so you can archive or share it later. We understand you might want to edit it before you share, so we’ve made it much easier to find your recording after you’ve finished every broadcast. From your recordings window simply click “Show” on any item in the list, and Mixlr will open up the folder where the recording is located on your computer and even highlight the file for you. Magic? Not really, but still very awesome. Now you can take your recording, edit it, and put all those final touches on your broadcast before you upload it to your favourite services. Maybe you want to trim, or make a short clip to share on social media. Perhaps you want to upload your live podcast episode to iTunes, put your last live gig on Soundcloud or last DJ set on Mixcloud. Or even share your awesome talk show on another platform, or simply archive it. It’s just that bit easier to get started with your recorded file once you’ve finished broadcasting. Just don’t forget to turn recording on before you start broadcasting! We’ve corrected the broadcast category list to avoid duplicate categories – although we like Jazz as much as everyone else, there was no reason to list it twice! If you haven’t updated already, download the new version of the app for Windows or Mac and do get in touch if you have any feedback. What is a Live Stream URL? And how to make the most of it. Your live stream URL is a unique web address, which carries your live audio stream every time you broadcast (For the technically minded, it’s a 128kbps MP3 stream, Icecast compatible, and will work with almost all browsers and listening clients). It’s a flagship Mixlr Pro feature which gives you total control over creating a unique listening experience, and deciding where your live audio can be heard online. You’ll find your live stream URL in your user settings. Although this humble URL might not look like much, it’s essential if you want to go away and build your own listening experience. If you’re already a Pro user, the next time you go live, try copying and pasting your live stream URL to your browser to see it working in its most basic form. Add your live stream to your own website. The advantage of creating a custom player is that you can change how it looks and behaves to fit perfectly with your own brand identity. Apply your own design assets, add more advanced controls, and choose to play automatically when a user visits your website. When you build your own player, it’s all totally up to you. Add your live stream to your own mobile app. For a fully tailored listening experience, build your own app powered by your Mixlr live stream URL. 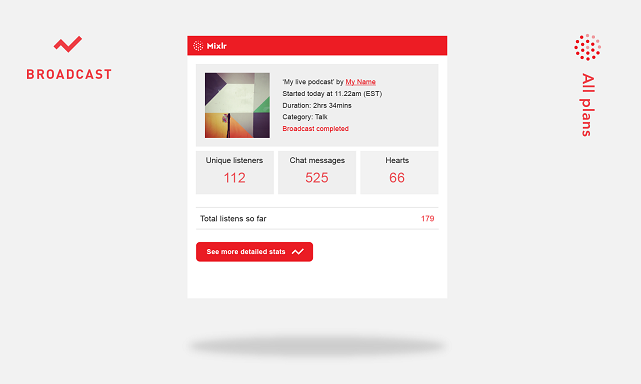 This unlocks unlimited potential to build richer interactions with your audience, gather your listener’s contact details, add your own chat, Twitter feed or Facebook timeline, and take control of who tunes in. Even add your live stream to third party services like TuneIn. Grow your listener audience by submitting your station to TuneIn. It’s as easy as copying and pasting your live stream URL to the TuneIn directory. Once approved, up to 50 million monthly listeners will have access to your stream. 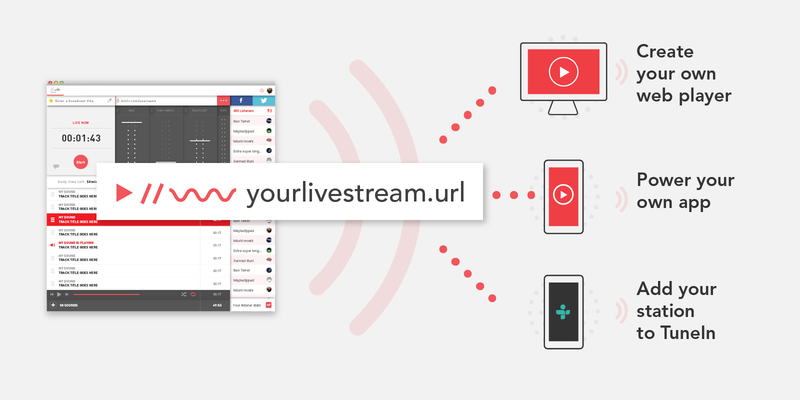 Your live stream URL is compatible with many third-party radio directories, some with millions of users – all potential new listeners for your live audio! 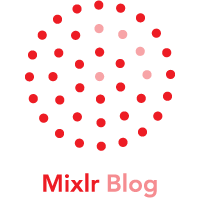 Now you know a bit more about what’s possible with a live stream URL, why not read more about all the other advanced features available with Mixlr Pro.